Duo or larger line-up. 3 hours playing over a 4 hour stay. 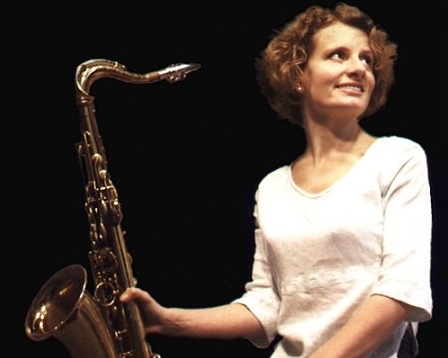 In February 2004, after regularly “guesting” with them, Karen became the permanent saxophone player with the Humphrey Lyttelton band – evidence, if any were needed, of the quality and consistency of her musicianship. Karen takes as the inspiration for her tenor saxophone sound, the “cool” school of jazz players which included Lester Young, Zoot Sims and Stan Getz. This is relaxed, laid-back, lyrical playing, which may sound effortless, but of course demands excellent instrumental technique and supreme command of the jazz idiom. Karen’s repertoire takes in literally hundreds of “standards”, ranging from Gershwin and Cole Porter to the bossa novas of Antonio Carlos Jobim and the jazz originals of Miles Davis and Wayne Shorter. She can even include some pop chart hits along with the jazz numbers. But whatever the tune, you can be sure that Karen and her band will produce elegant and graceful music, particularly suited to providing a background atmosphere for parties and receptions of all kinds. Our demo tracks feature Karen in a duo setting with piano and in a quartet including double bass and drums. Unless otherwise stated, our quoted price is for the duo, but the line-up is flexible and Karen can even add a trumpet and singer for a larger band. Karen’s “sidemen” are all respected professionals on the London jazz scene, and their empathy and musical sensitivity can be readily heard on the demo tracks. Our price covers three hours of playing over a four-hour period. As well as private functions, Karen is a frequent performer at clubs, restaurants, wine bars and similar jazz venues, and her CDs have been played on Jazz FM and BBC radio. Karen Sharp is based in London. See Pricing for details of travel costs, etc. "The Karen Sharp Trio were fantastic - they were polite, flexible and most importantly played superbly. We had many comments from our guests complimenting them." "A wonderful act. Just what my company was looking for. They started the night off superbly and created a positive and uplifting atmosphere." "The trio were excellent on the day. We would definitely use Function Junction again in the future. Many thanks." "Fabulous service and quality all round as always. Our partners and guests can’t get enough of The Karen Sharp Trio." "Wonderful service provided, highly professional musicians and would strongly recommend to friends and contacts."